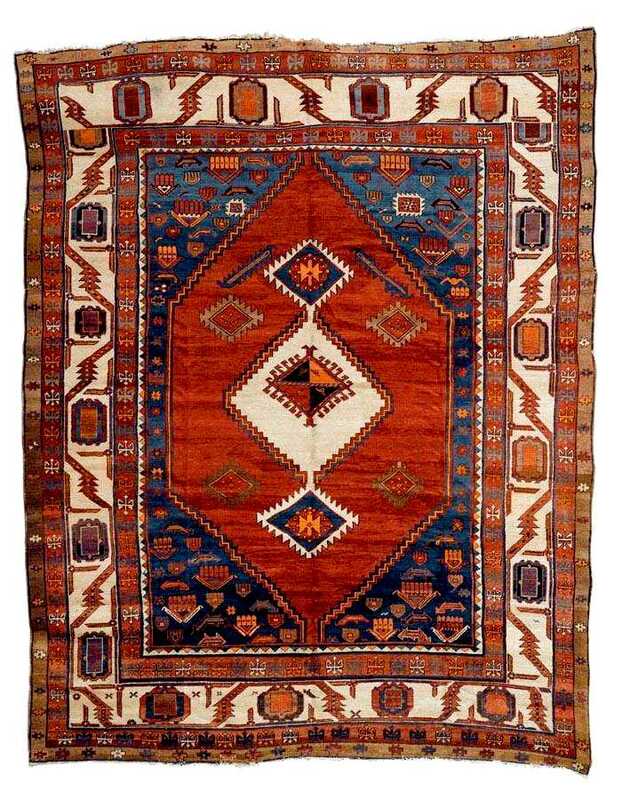 These rugs can be grouped with rugs woven in a particular style and time frame in the Heriz area. 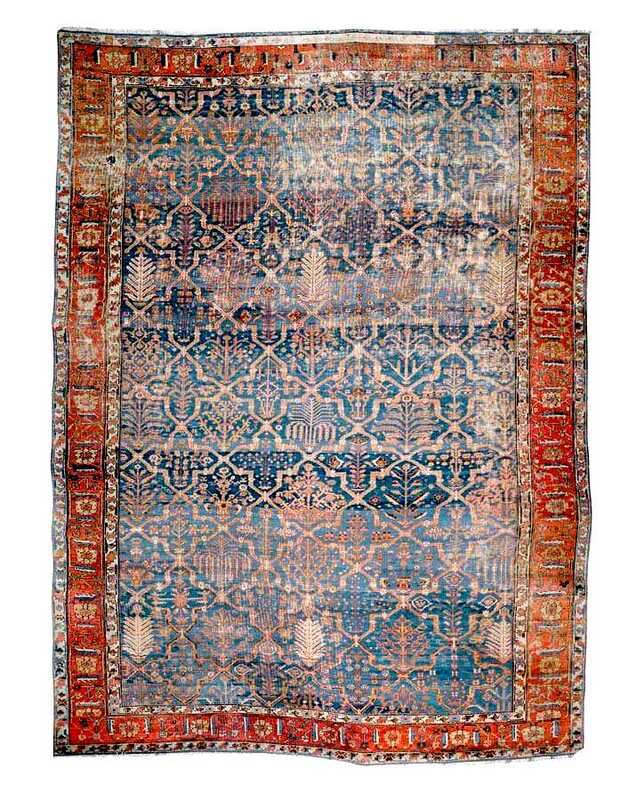 The Heriz Rug producing area has gone through a number of name changes over the years. At one point the region was known as the Khanate of Serab. After that the region was called Bakshaish. It is possible that the town of Bakshaish was the administrative center of the District. It is also possible that the district and the region takes it name from a person or group of people. 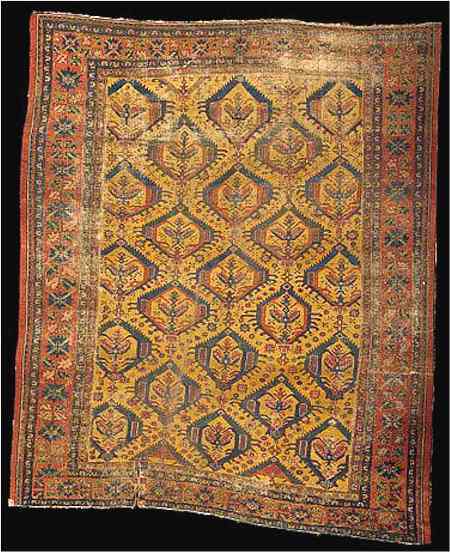 Bakhshaish was a Khanate in the Khajar Dynasty perion of Iranian history. Bakhshaish the old name of the area of the province of Azarbayjan-e Sharqi that runs from Lake Urumia to Heriz. Now the region is called Heriz and Bakhshaish is called Kovanaq. 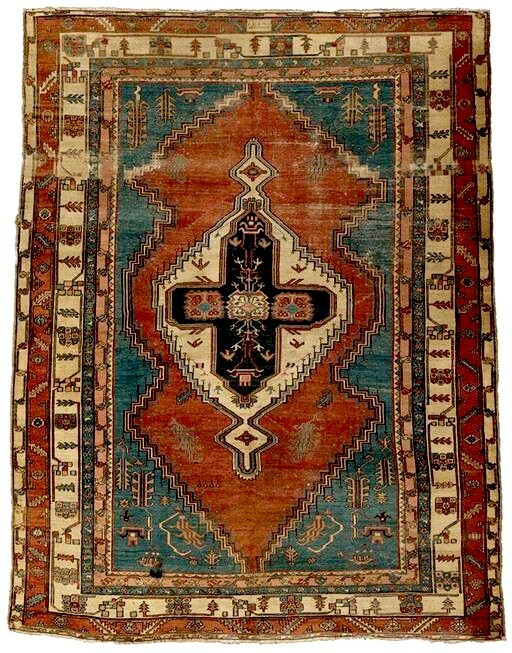 Through the 19th century border wars between Persia and Russian would send waves of Moslems south and Christian Armenians north. 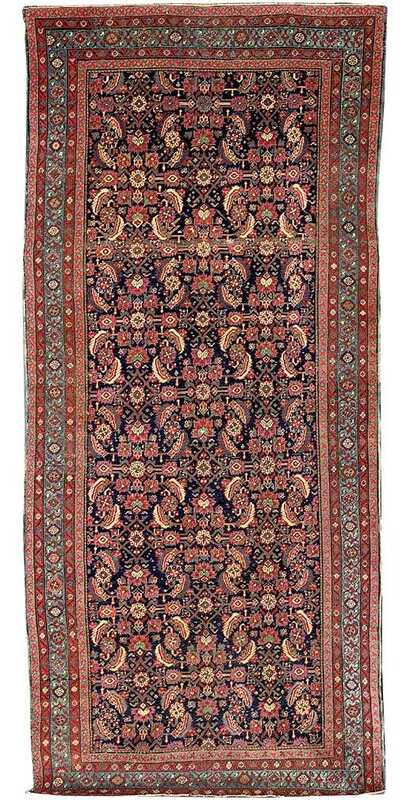 Bakhshaish is one of the first areas in the Mount Sabalan Persian Azerbaijan area to begin production of Carpet size. 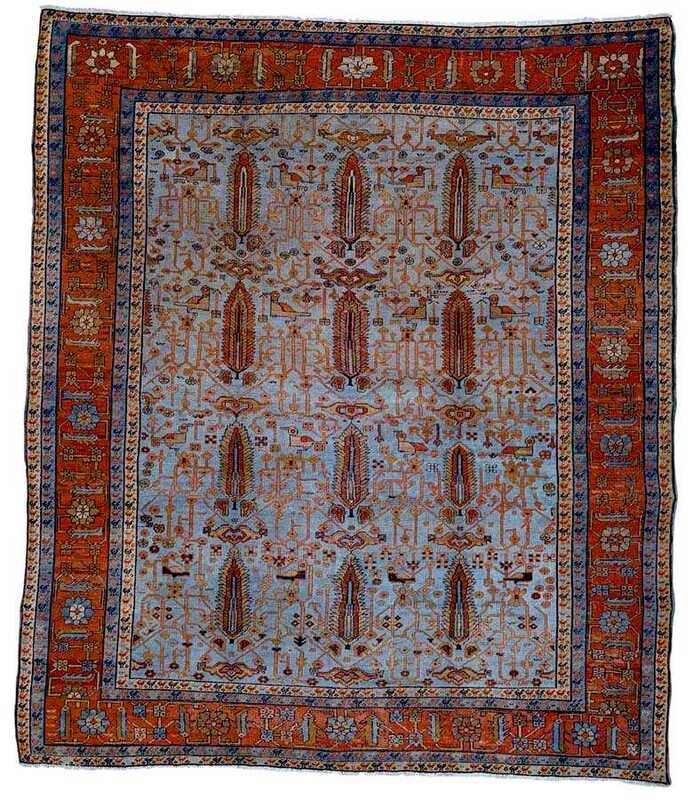 Sotheby's has attributed two carpets to 1800; Sotheby's Bakshaish Rug circa 1800 Lot 106 and Sotheby's Bakshaish Carpet c. 1800 lot 177. Which pre-date the next oldest by 75 years. It is easy to see the 1800s dates as adventurous but it may just as well be that other dates are conservative. 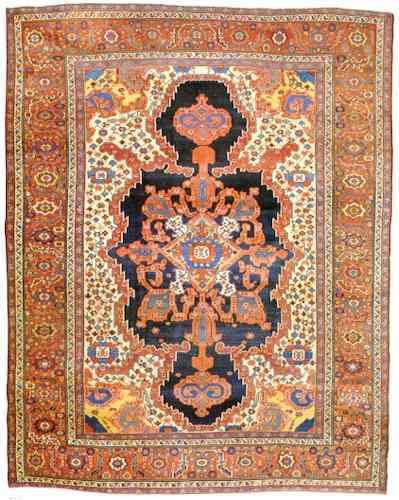 Most Bakhshaish are attributed to circa 1880 and it is very improbable that all the rugs dated circa 1880 were made then. 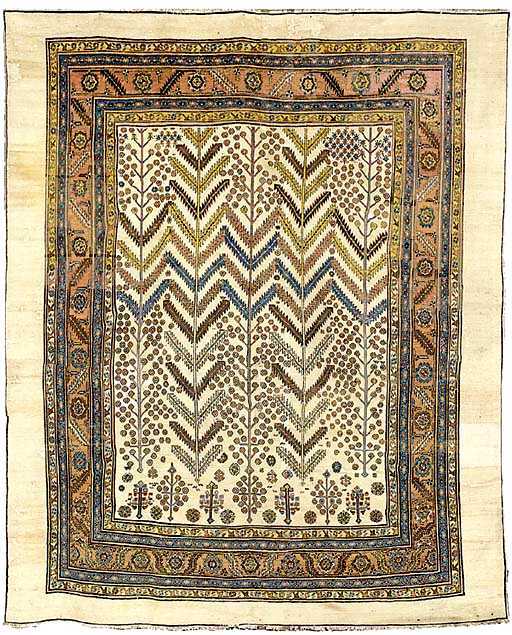 As Harold Keshishian used to say in his textile Museum Lectures, "They can't all be made in 1875, some must be older". 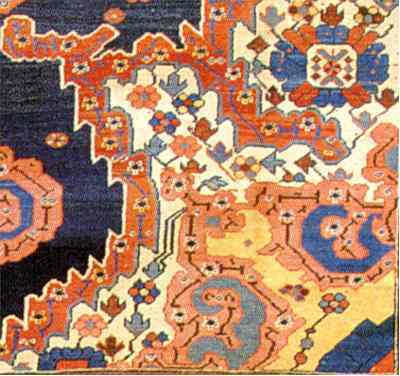 Heinrich Jacoby the great German Rug Expert who ran PETAG wrote in 1949 that Heriz Rugs and Bakshaish rugs could be distinguished from similar rugs elsewhere in Persia by their "soft coloring" which he attributed to the local water. 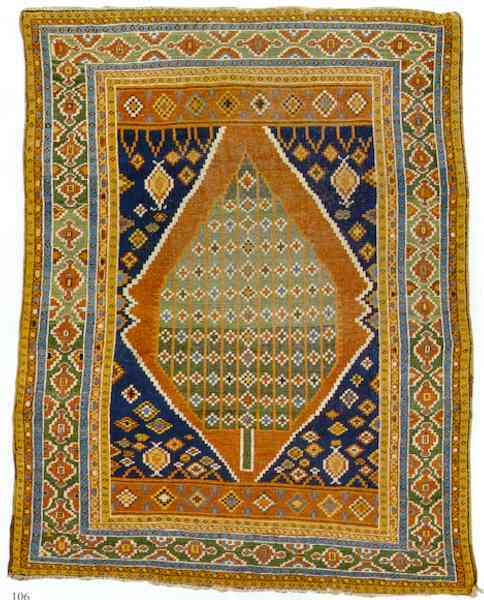 It is very possible that the coloration is influenced by the copper in the ground water in the greater Heriz region. 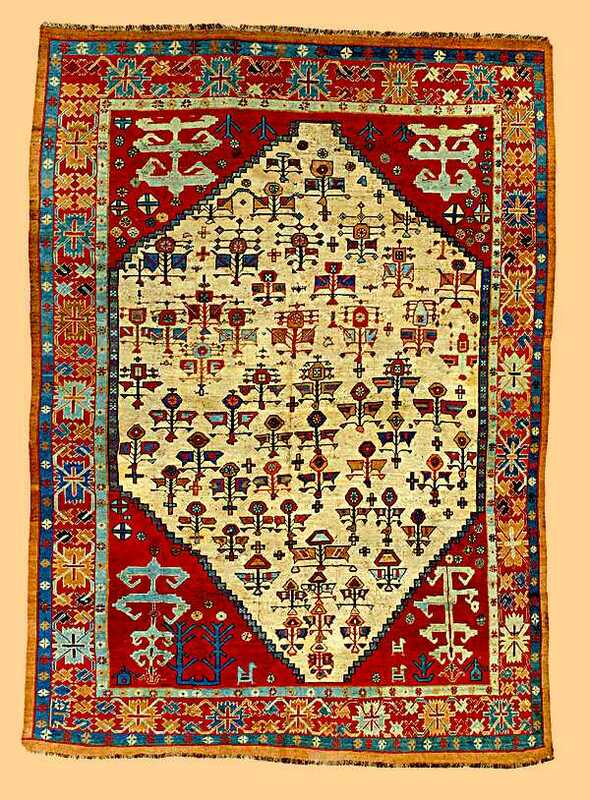 Jacoby also mentioned that Gorevans and Bakshaish carpets were coarser than Heriz Carpets and that they had large wefts almost the size of the warps but Heriz used thick warps with much thinner wefts. 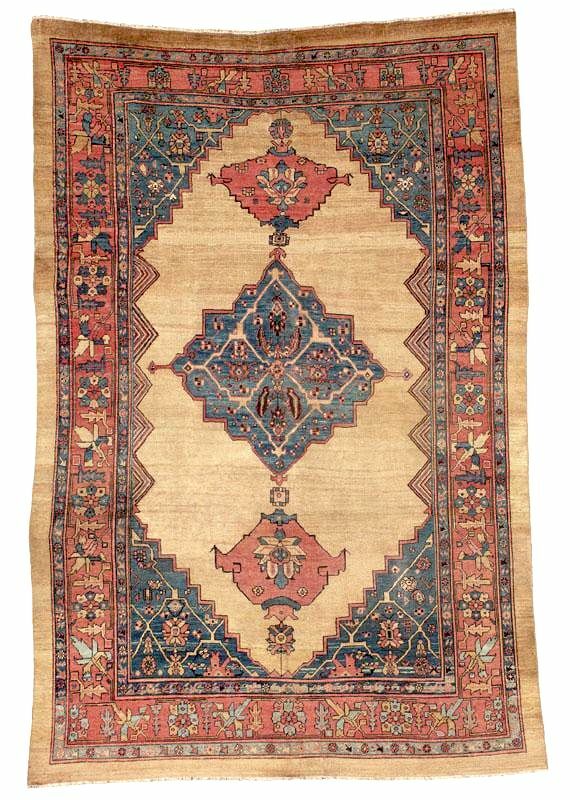 This is a striking example of the Mini Khani Carpet. 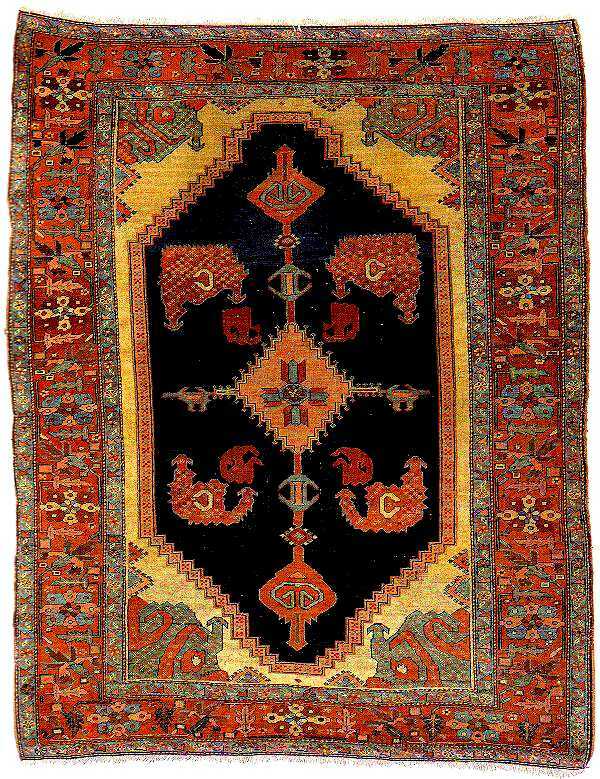 A Bakshaish Carpet 19th C.
The zoomorphic motifs found on this particular design help to define a subgroup of rugs made in the northwest Persian village of Bakhshaish. These representations can be seen in the two pairs of stylised dragons attempting to encircle a smaller animal-like figure on the blue field, beside a cruciform, almost totemic element. 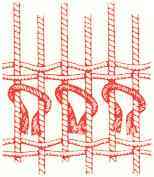 Such motifs can also be seen in the spandrels, where the green and red scales of the dragons are abstracted in order to create quarter medallion corner motifs. 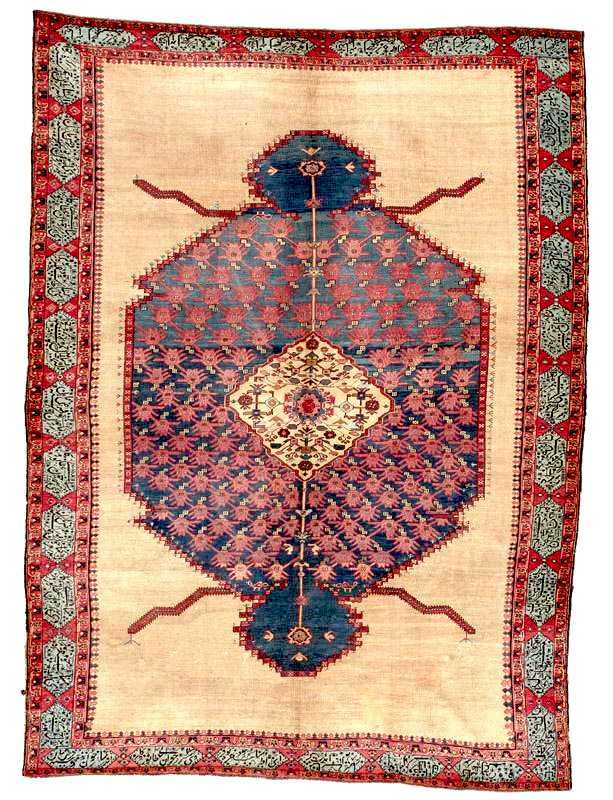 This typology originates from a group of very early Anatolian rugs decorated by an axis element surrounded by two pairs of stylised animals (see C. Klose, 'The Origin of the Serapi Carpet Design', Hali, vol. 6, no. 4, London, 1984, pp. 401-402). circa 1890. Partially oxidized browns, minor partial ends. Trees are one of the most common designs. Trees include willows, cyprus, and flowering trees. 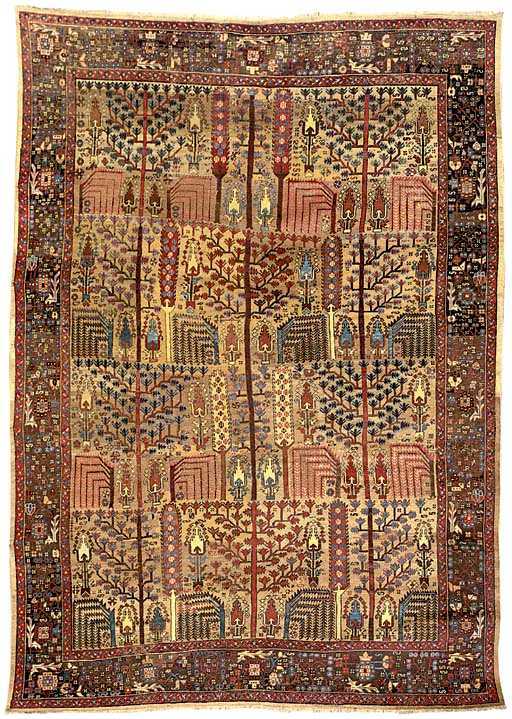 This carpet has Cypress trees with interspersed Bulbuls (birds). 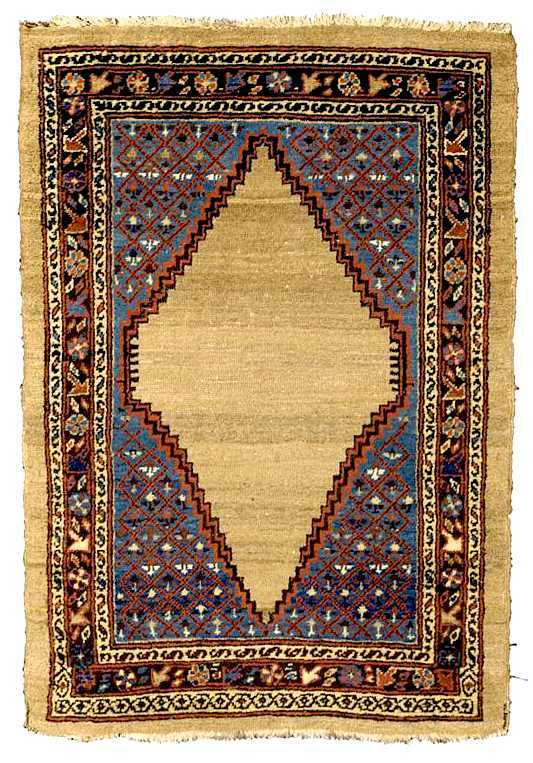 This rug is notable for a very unusual Chicken Border. 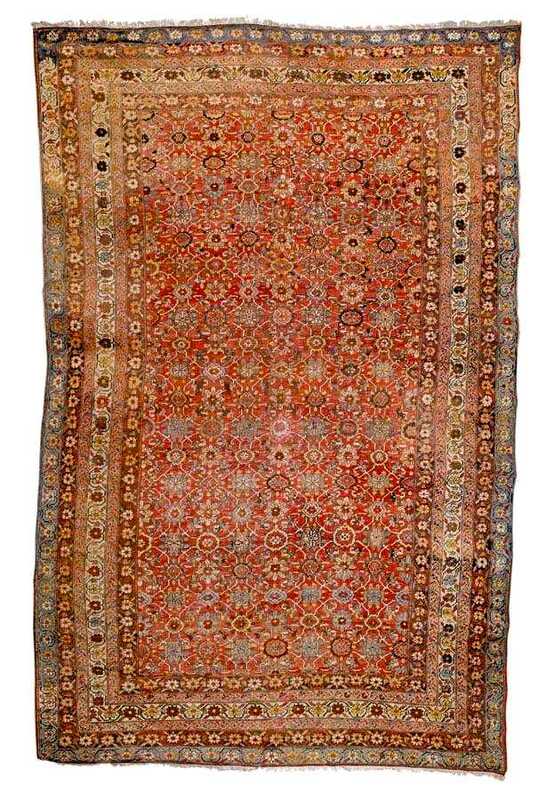 Description: BAGSCHEIESCH CARPET Origin: North West Persia, Azerbaidjan, mid 19th c.